Deciding where to get married should be one of the first things to cross off from your wedding to-do list. Once you've booked a wedding venue, you can start looking for other essential wedding vendors such as your caterer and decorator. But how do you even decide on a wedding venue in the first place? What makes a good wedding venue? We understand that everyone has their own dream wedding venue. For some couples, it can be as simple as the backyard of their childhood home, but for others, it may be as grand as the Plaza. Wherever it is, your venue should suit the kind of dream wedding you want to have. Go through the list we've prepared below to get an idea of what your wedding venue should be like. Tying the knot in a hotel or resort has long been a popular choice for couples across the globe. After all, it's convenient for both you and your guests! 1.Ballroom weddings are a foolproof choice, as most hotels offer all-inclusive packages that include catering, entertainment, rentals, decoration, and of course, accommodation. 2.Hotel packages include rooms for the bride and groom, and also the family. There's no need to worry about waking up early on the big day or coming home late if you're planning an after-party at the hotel. 3.Bigger hotels have plenty of parking space, a big plus if your guests will be driving. You can also book rooms for guests coming from out-of-town at a discounted rate. 1.Ballroom weddings can be really expensive, depending on the hotel. Naturally, the bigger and more prestigious the hotel, the pricier it will be to get married there. 2.If the hotel has more than one ballroom, there might be more than one wedding held there at the same time. Make sure to ask your hotel about how they handle multiple weddings. 3.Hotel weddings can be a bit boring as wedding packages offer the same things. You will need to book extra vendors, that come with a high price, to add a personal touch. This could be a conference hall in an office building, a multi-functional event space, or a government-owned building. 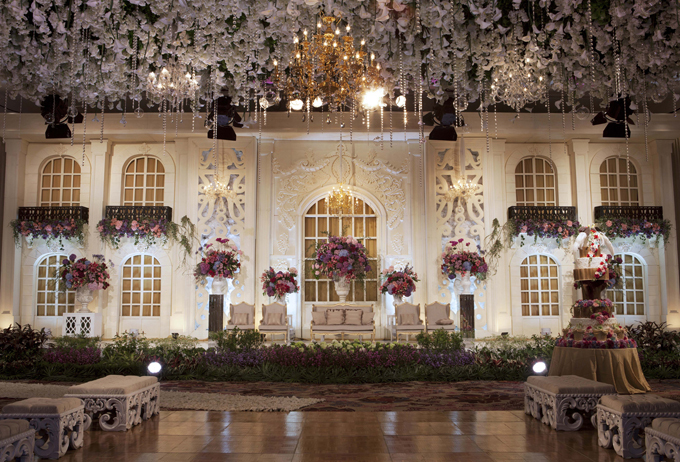 Function halls are so versatile, it's no wonder that most Indonesian couples choose to get married in one. 1.Most function halls partner up with other wedding vendors to offer all-inclusive wedding packages that can be much cheaper than those offered by hotels. 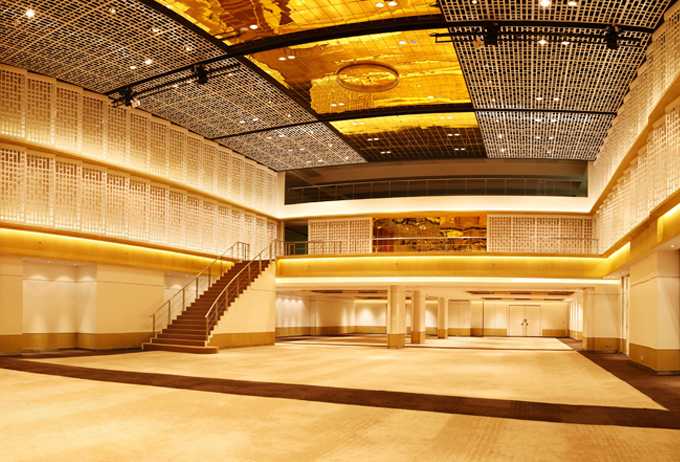 2.Function halls are large enough to fit even thousands of guests without costing a fortune. You also don't need to worry about the weather as everything is held indoors. 3.If you have a particular wedding theme and the budget to make it come true, a function hall is like a blank canvas that you can decorate to your heart's content. 1.The standard decoration, if there is any, tends to be a bit bland and boring. If you choose a function hall, you'll need to put in more effort and funds to decorate the whole. 2.As function halls are very popular for weddings, exhibitions, and all sorts of events, you'll need to book at least six months or even a year before the big day. 3.There is no built-in accommodation, so you and your guests coming from out of town will have to brave the traffic to reach your venue. 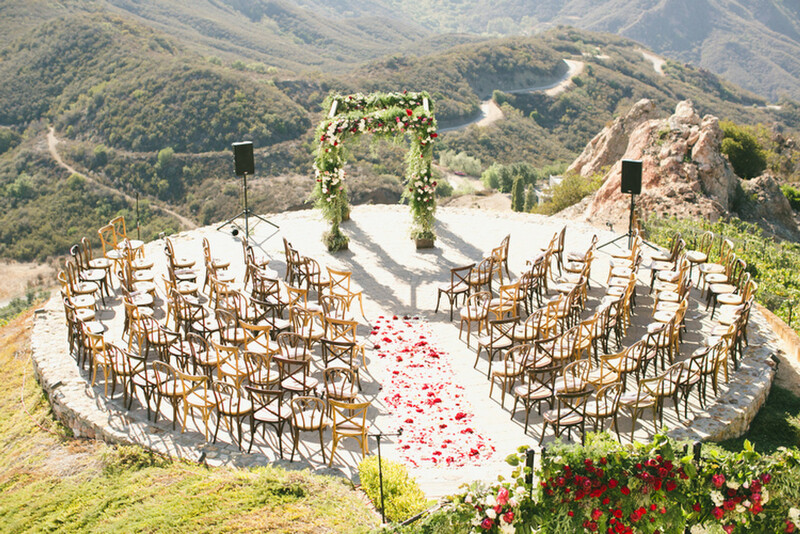 An outdoor wedding can take place anywhere you like, such as a garden, public park, or vineyard. Unlike ballroom weddings that can have a stiff or formal ambiance, outdoor weddings are more chic and relaxed yet no less beautiful. 1.You will be surrounded by picturesque trees, plants, and beautiful flowers, so you don't need to spend too much on decoration and wedding flowers. 2.Outdoor wedding spaces are often large, and your guests will breathe easier and more comfortably as your wedding will be held out in the open. 3.Some venues have both a vast outdoor space and a smaller indoor area that can be a lifesaver in case of a heavy downpour. 1.You have limited months to choose from as you need to carefully consider the season. Outdoor winter weddings aren't comfortable, while vineyard weddings held in the spring will not look beautiful as all the vines will be brown. 2.Aside from the season, you'll have to deal with problems caused by unpredictable weather such as the rain, wind, and drastic changes in temperature. 3.Outdoor wedding spaces are high in demand as there just aren't enough of them available, so you can miss out if you don't book fast enough. Destination weddings are getting more and more popular lately, and it's easy to see why. Your wedding will be so exciting and also double up as a short getaway for your guests. 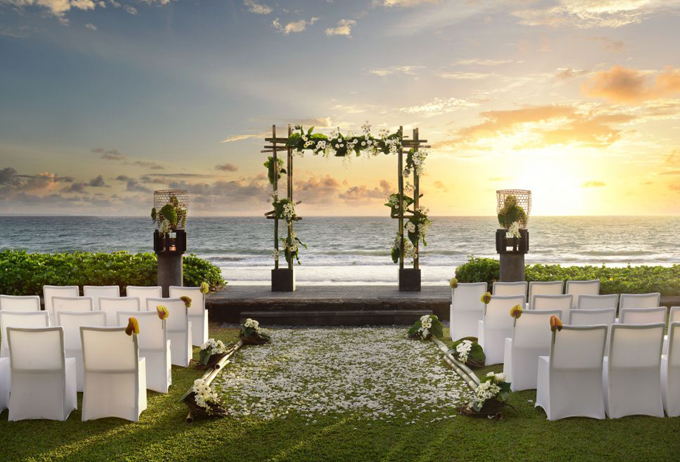 1.There is no greater decoration for your wedding than the natural scenery of a beach or ocean that you just can't get anywhere else. 2.This is a chance to invite only your dearest friends and family. With such a small guest list, your wedding will be much easier to manage and even end up being cheaper than you expected. 3.You will have plenty of quality time with your loved ones, as you can arrange intimate dinners and day trips before or after the big day. 1.Some of your guests might not come due to expensive costs, their busy work schedule, or the children they can't leave behind. To make things easier, you might need to consider a child-free wedding. 2.You'll have to prepare detailed information or welcome kits to keep all your guests entertained, especially if your wedding is held somewhere exotic and out-of-the-way. 3.All of your wedding planning will be long distance, and dealing with language barriers or local regulations like marriage license might add a lot of extra stress. This is the best place for intimate indoor nuptials like this one, ideally with no more than 100 guests. If you're looking for a small reception space, you should definitely consider this option. 1.You don't need to worry about catering, as restaurants already have high quality food, cutleries, and professional wait staff standing by. 2.Many restaurants are already nicely decorated with a certain theme. If you want to add any extra decorations, you only need to focus on the table settings and a few centerpieces. 3.Restaurants are perfect for intimate weddings, as they have a cozy and somewhat homey ambiance without requiring all the extra efforts of throwing a wedding at home. 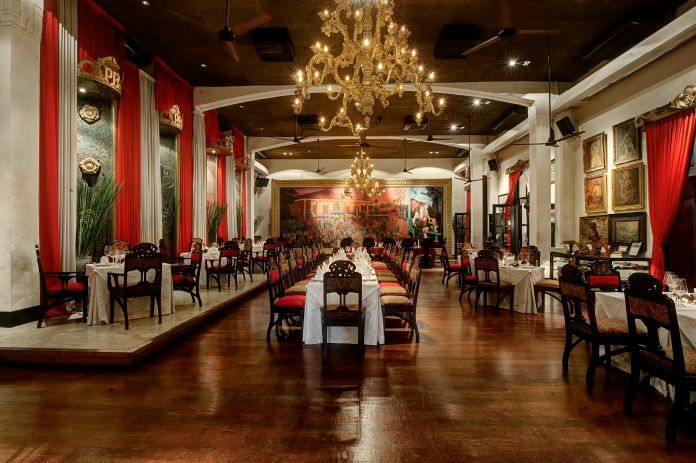 1.Restaurants have limited space, usually only up to 150 guests. Full privacy is only available if you do a buyout of the whole restaurant, which might not be as cheap as you think. 2.Restaurants are only suitable for seated dinner receptions, as there is not enough space for a wedding ceremony or a dance floor. 3.There are no rooms available for preparation, so you have to dress up and have your make up done before you head to the restaurant. If you have enough space in your house or lawn, there's no place like home to get married in. If you want the cozy atmosphere without the hassle, don't worry. 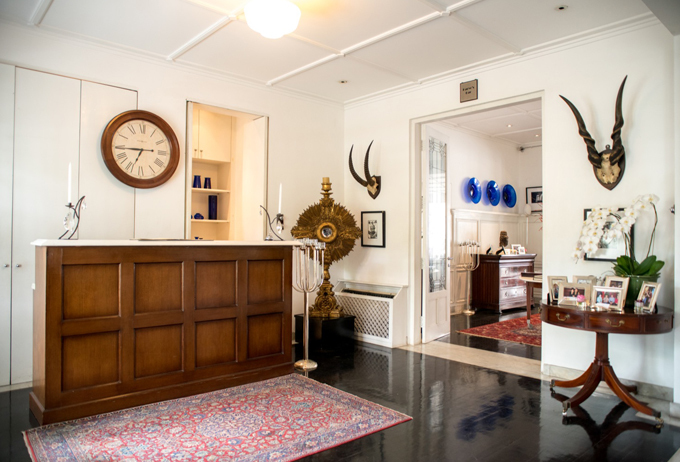 These days, there are many beautiful private homes that can be rented for special occasions. 1.Your home is, hands down, the most flexible wedding venue to rent in terms of availability. No need to worry about low or high seasons! 2.Wedding venues usually take the biggest chunk of your wedding budget. By getting married at home, you'll save a significant amount of money. 3.Your beloved home holds all your precious memories, and is the perfect setting for an intimate wedding with your dearest friends and family. 1.You'll need to rent tons of things that you don't have, from tents to cutleries. As a results, you have to allocate a lot more money to your wedding rental budget. 2.Permits might be needed from your neighborhood, as you might disturb your surroundings with loud noise and take parking space from your neighbors. 3.There will be a huge mess left over after the wedding. Unless you want to spend your newlywed life to clean up everything, you'll have to hire a professional cleaner. If the venues we've listed above leave you cold and you're looking for something out-of-the-ordinary, there's no need to worry! The sky, or maybe your wedding budget, is the limit when it comes to your dream wedding venue. We've collected 10 unique and completely unexpected places where real couples have actually tied the knot. Just like we said, the sky's the limit. Christina and Tyrone went high and above with a mountain-top wedding that offered magnificent 360-degree views of the surrounding lush hills. Ever dreamed of having your very own royal wedding? 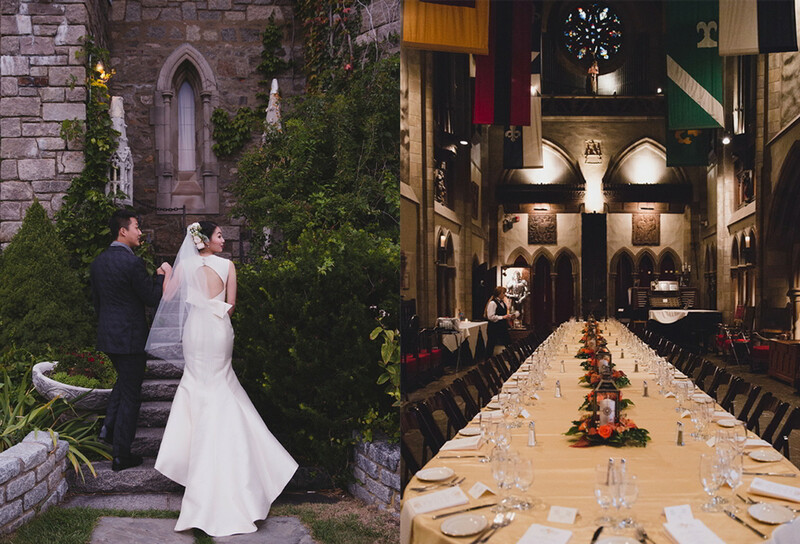 Follow the lead of this couple, who became queen and king for a day during their wedding at Hammond Castle, Massachusetts. 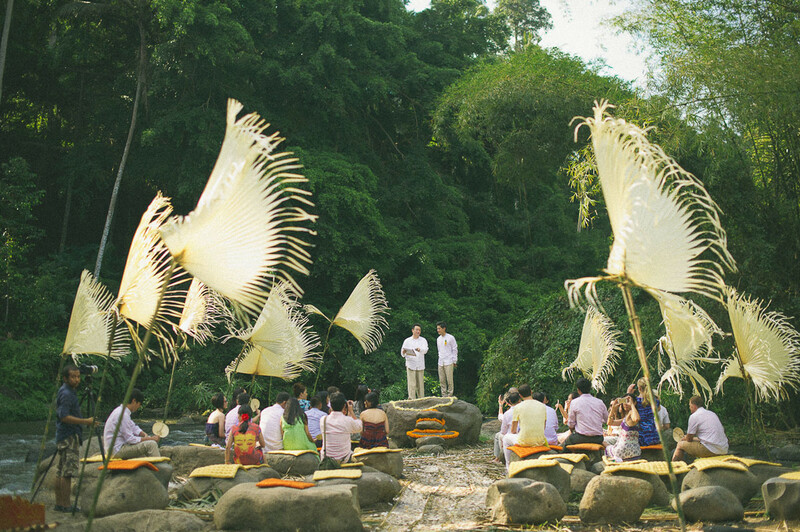 Doesn't Zack and Chichi's riverside wedding in Ubud look blissful? 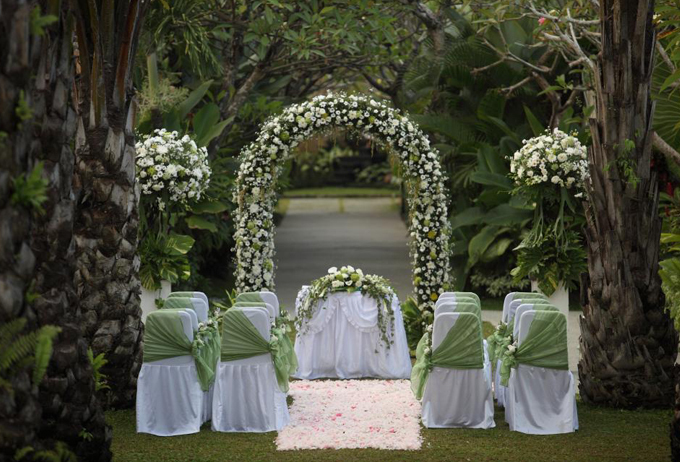 Imagine the gentle breeze and calming sounds of the Ayung River that accompanied their serene wedding ceremony. The library is anything but boring, especially for bibliophiles. 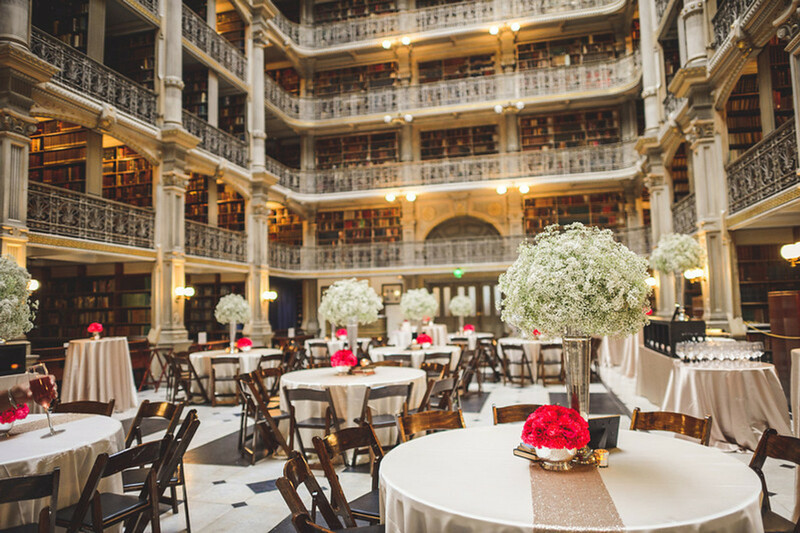 As the George Peabody Library in Baltimore shows, it can actually be an unforgettable space for your wedding celebration. You don't need to spend a fortune to get married surrounded by nature. 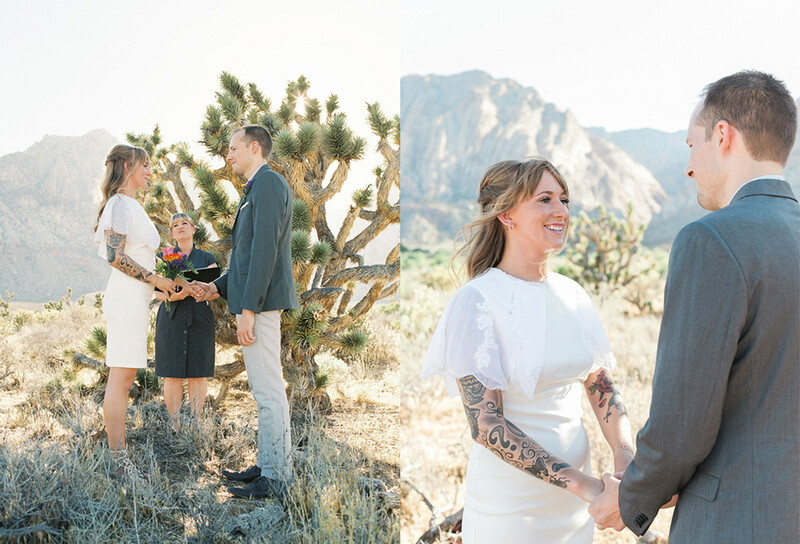 This couple only brought along a photographer as they braved the heat for a desert elopement in Nevada. 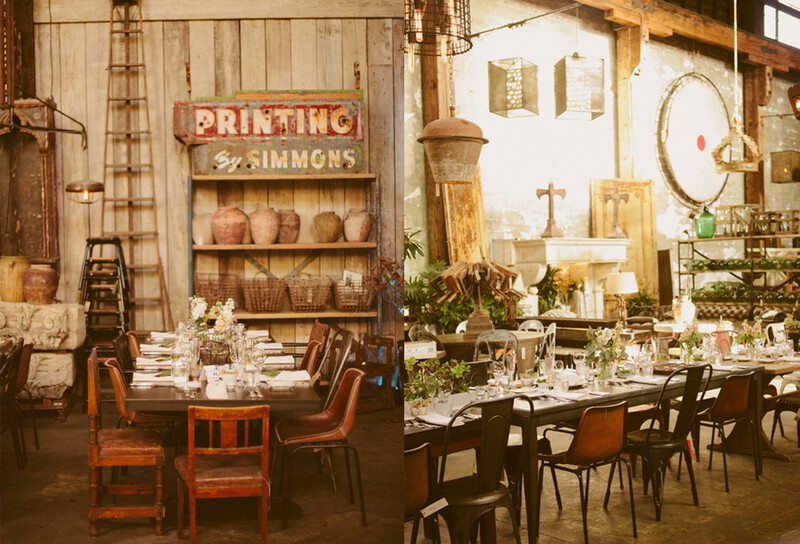 An antique store is the perfect setting for an industrial or vintage-inspired wedding. Gorgeous decorations are already provided, so there's no need to worry about getting the venue pretty. Getting married in a museum sure sounds perfect for art and history buffs. 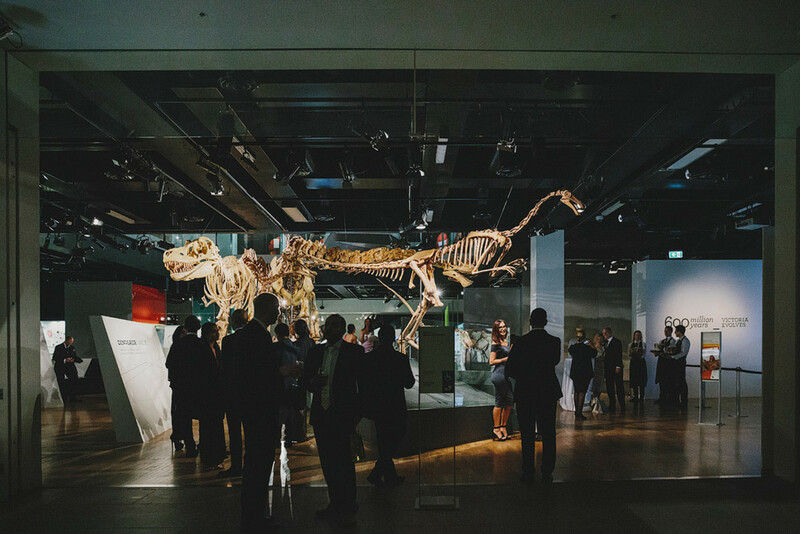 In this museum wedding in Melbourne, the guests enjoyed cocktails and canapés among dinosaur skeletons! Winery weddings sure are lovely, but wine cellar weddings have their own unique touch. 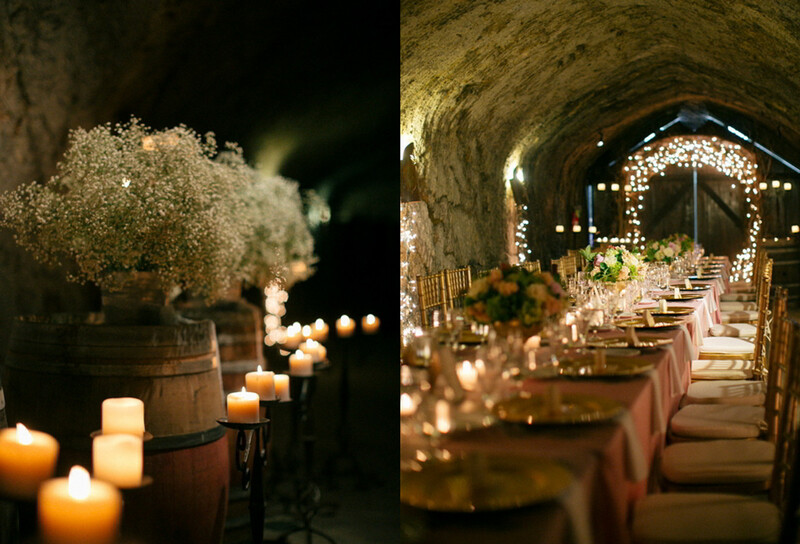 Underground wine cellars can add a luxurious and old-world vibe into the celebration. Fairy lights, wooden tables, and Mother Nature; the perfect elements for your wedding celebration. Not convinced yet? 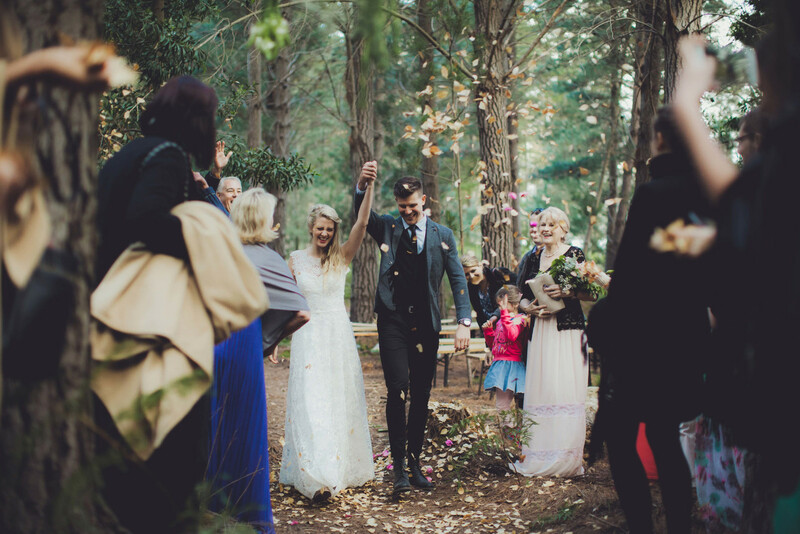 Just check out Clarissa and Wessel's magical forest wedding. 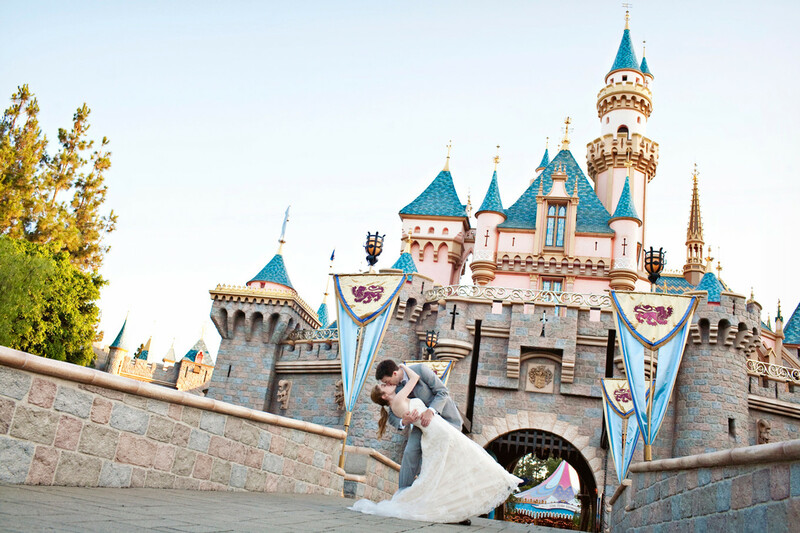 There are many ways to have a Disney-inspired wedding, but why not go straight to the source and start your journey of "happily ever after" at the happiest place on earth? Seeing all the wedding venue options above must have given you plenty of ideas already, but we understand if you still feel a bit confused on how to start. 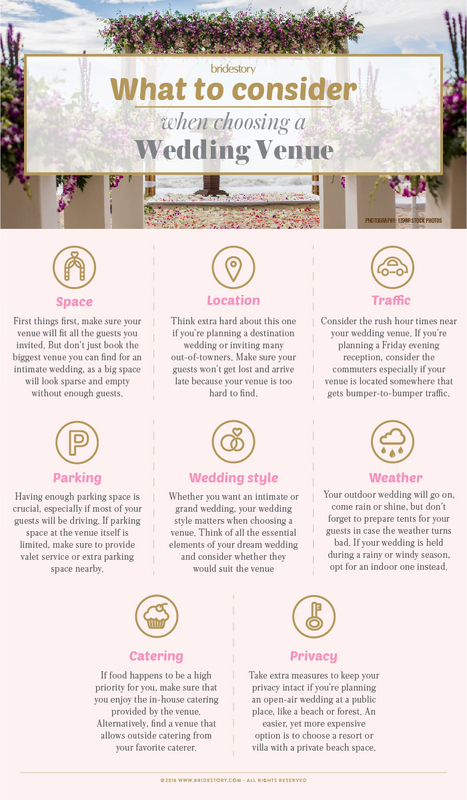 Don't worry, just go through the dos and don'ts below before you start looking for the perfect wedding venue. No matter how beautiful the photos may be, you can't get the complete picture of any wedding venue without actually visiting the premises. Different angles, lighting, and even the weather can make your venue look different than what you've imagined. With so many options out there, finding a venue might sound easy. But remember, you're not the only one who's getting married! Wedding venues get booked out early, so secure your reservation at least six months prior to your wedding. A good wedding venue will easily become popular as couples will gladly recommend it to others. If you know any friends or relatives who've recently gotten married in a venue you're interested in, don't hesitate to ask for their honest reviews and opinions. With so many amazing venues to choose from, you might find yourself tempted to book one that is way over your wedding budget. Don't let yourself be swallowed in debt just to throw a wedding party somewhere you can't afford. Just look around closely, we're sure you'll find the right venue. You shouldn't have too few options, but having too many will leave you confused. It's best to start with your basic requirements, such as the number of guests you're inviting, your preferred location, and whether you want an indoor or outdoor wedding. Next, compare similar venues to find the best price and benefits. Saturday is undoubtedly the most popular day to get married. Unfortunately, this means that Saturday night slots are very expensive and most likely to be fully booked. If you and your relatives don't mind, consider a Friday evening or Sunday morning reception. Most wedding venues have partnering vendors for catering, decoration and lighting, or entertainment. They are usually included in the venue's wedding packages but if they aren't, just ask your venue for a list of preferred vendors. You're guaranteed to get a good deal this way, and your vendors will already be familiar with your venue's layout and capacity. Once you've found the perfect venue, don't just sign the contract right away. As always when dealing with wedding vendors, you should negotiate. Ask for the best deal in the form of discounts or complimentary add-ons, then make sure they are written down clearly on your final contract. Have you gotten in touch with potential wedding venues? Great! 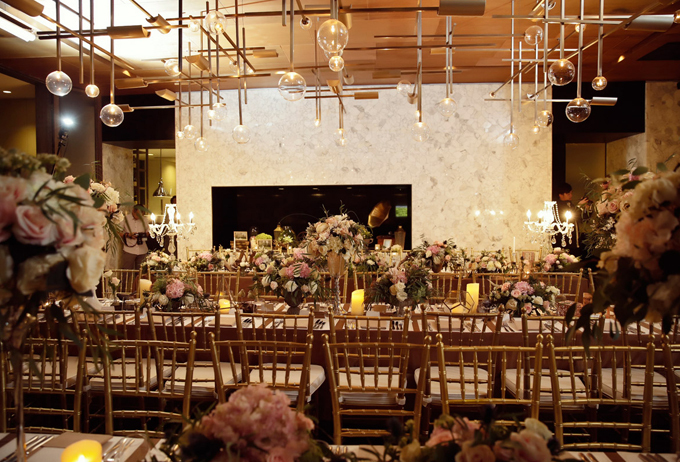 Now, just go through our list below to find out what you should ask your venue to make sure it will be a great fit for your wedding celebration. Now for the great news you've been waiting for: yes, you can get married at your dream wedding venue while still sticking to your budget. As long as the wedding venue you're interested in isn't completely out of reach, there are many ways to make it possible. 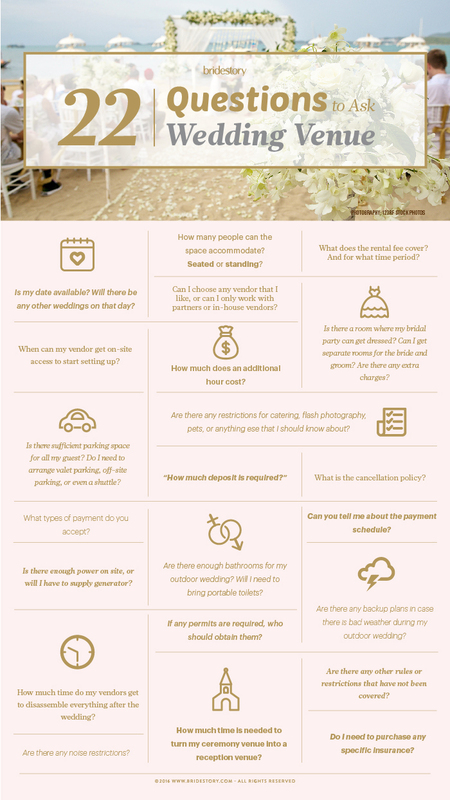 Follow the steps below to make your dream wedding venue more affordable. Your first option is to book your venue on a weekday. Sure, a Thursday night wedding might not sound appealing at first, but what if you can cut approximately 10 to 20% off your budget? If you really must have a weekend wedding, consider pushing your Saturday wedding further to Sunday. Most venues have peak and low seasons. Generally, you can trim your budget up to 25% by choosing a wedding date from December through March. This doesn't apply everywhere, though, so just ask your venue for more information. The third and probably most difficult option is cutting the guest list. It won't feel nice at first, we know, but this decision can help you save a huge amount of money. On the bright side, you can have a more intimate and fun wedding with your loved ones, just like this couple did.